1958 Ford Zephyr - The Zephyr line of cars was introduced by Ford in 1951. In the UK - where they were manufactured - they were immediately successful. It was a big car - by British standards - that could comfortably seat 5. It also had some success as a rally car. In 1956, Ford introduced The Zephyr Mark II. It had a new look, a larger wheelbase and larger engines were available. With the Mark II, Ford started also building the Zephyr in Australia, where a very cool pickup truck variation was available. Ford, somewhat halfheartedly, imported these cars to North America. This car, being left had drive, is most likely one of those cars. 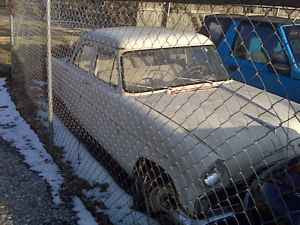 The seller of this Zephyr says the car has "no body damage, but does have some rust spots". From the tiny Craigslist pictures, it looks like it could use some new rocker panels, at least. (This is a unibody car, so the repairs need to be done with metal.) The seller also claims that it ran 8 years ago, but has been sitting ever since. Best of all, the car appears to be complete, with most, if not all, of its hard to find (especially in the US) trim pieces in place. Located in Gallatin, TN, click here to see the Craigslist ad. 1964 Hillman Minx - Unlike Ford, which put very little effort into marketing the Zephyr in North America, Rootes made North American sales of the Hillman Minx a priority. It wasn't very successful. The Hillman Minx name goes all the way back to 1932. 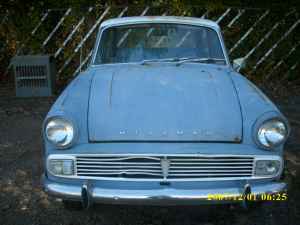 In 1956, Rootes introduced its first unibody car which was known internally as the "Audax" Hillman Minx. The Audax cars were designed in part by American stylist Raymond Loewy, who had designed some of the more interesting Studebaker coupes. 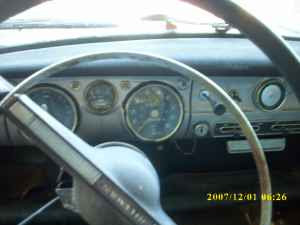 The Minx, when compared to other non-exotic imports of the time, was a well equipped, comfortable sedan. Unfortunately, a spotty (at best) dealer network in the US and initial build quality issues kept them from ever selling well here. 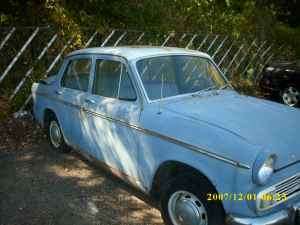 According to the seller of this Minx, the body is in "excellent shape", with just some "minor surface rust". Like the Zephyr above, it looks like it can use some new rocker panels at the very least. The good news is that it looks like all the now extremely hard to find trim pieces are still with the car. Located in Conroe, TX, click here to see the Craigslist ad. 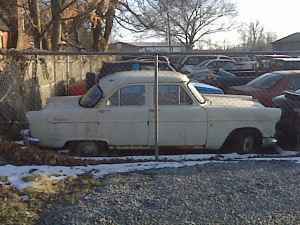 1958 Volvo 445 Duett - The legend of the Duett goes something like this... 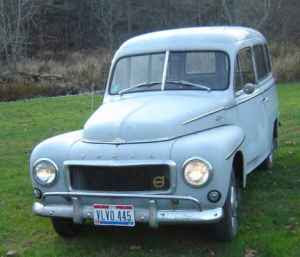 In 1949 Volvo created the 445 chassis. The engine, front end (including the cool split windshield) and front suspension were from the PV444 car. The ladder frame (the 444 was unibody) and much of everything else was unique to the 445. Most of 445s were sold to coachbuilders who turned them into pickup trucks, vans, ambulances, etc. According to the legend, the chassis and engine in the 445 were so good, people were not giving them up and they weren't breaking down. 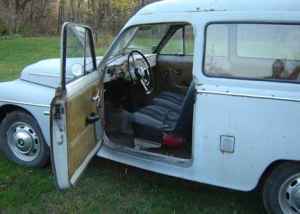 Because of that, sales of the chassis were slower than expected and by 1952 Volvo found itself with 1500 unsold 445s chassis on their hands. Volvo president Assar Gabrielsson gave the directive to Volvos designers to come up with a body for these chassis, one that was suitable for both commercial and people transport. The Duett was born. It could be used as a delivery vehicle during the week and as a comfortable sedan away from work. Volvo built these, with minor changes, right up until 1969. This Duett is a rolling restoration candidate. The seller, who has owned it since 2005, drives it during the summer. The car has new tires and a new exhaust. It is in primer and appears to have little, if any, rust. All of the trim pieces look to still be with the car. Of the 3 cars I featured in this post, this would be the easiest to find parts for and would most likely give you the least amount of problems after it's restored. It's also the most unique looking. Located in Ashtabula County, OH, click here to see the Craigslist ad. A very big thanks to Jon for sending me the link to these 3 cars! 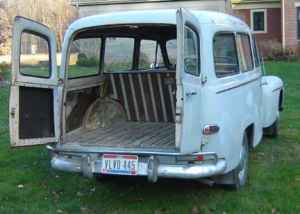 I just saw ANOTHER Duett for sale and it looks like a twin to this one. It's in Sebastopol, CA, just parked at the side of the road, waiting for some hero to save it. These cars are the perfect tweek to the American Woodie. A little truckster- with a Swedish tilt. I would LOVE to have one. Best of luck to the lucky buyer. Such a sweet ride. Tow your vintage race car! I ran a Duett from 1976 to 1991, with power and brake upgrades. And bigger tail lamps. These cars always get hit in the rear. Ohio's solution is a front bumper. Kills the tire bay.Incredible reliability for it's era.